With the crisis showing little sign of fading, Prince Khalid bin Salman, the crown prince’s younger brother and ambassador to the United States, returned to Washington on Wednesday for the first time since Mr. Khashoggi’s killing. 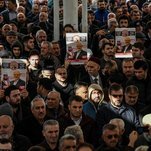 The ambassador, 30, left abruptly in October as pressure was increasing on Saudi Arabia to clarify what had befallen Mr. Khashoggi. The ambassador has been accused by some senators and others of abetting a cover-up. A Saudi Embassy spokeswoman in Washington, Fatimah Baeshen, who confirmed in an email that the ambassador had returned, also said the Saudi foreign minister, Adel al-Jubeir, was in Washington, representing Saudi Arabia at the funeral of President George Bush. It was unclear why the ambassador did not attend the funeral as well. A Saudi official, who spoke on condition of anonymity because the official was not allowed to brief the news media, attributed it to a delay in the ambassador’s airplane. The Saudi authorities initially denied that Mr. Khashoggi, a critic of the kingdom under Prince Mohammed, had been harmed in the consulate. After issuing several different accounts, the Saudis acknowledged that he had been killed after what they described as a botched attempt to force him to return to Saudi Arabia. Turkish officials have insisted that the killing was premeditated. The body has not been found. “In light of information obtained by the judicial authorities of the Kingdom of Saudi Arabia as part of the investigation, there is strong suspicion that Ahmad al-Assiri and Saud al-Qahtani were among the planners of the incident,” the acting chief prosecutor, Hasan Yilmaz, said in the application for the arrest warrants. The Turkish official familiar with the investigation said that the phrase “among the planners” indicated that the list was not necessarily final.